One year ago, Bennington's girls toed the starting line of the Class 2A state cross country championships with high hopes of winning the school's fourth girls title. What transpired over the next 20-25 minutes was not exactly what the Bulldogs had envisioned. Sure, freshman Kya Johnson was a nice surprise. She roared through the Wamego Country Club course to a winning time of 19:36, just the second Bennington girl ever to win the individual title. But Bennington eventually fell to a strong Ellinwood team, which captured the team title by a decisive margin of 45 points. In what should have been a close team race, Bennington had an off-day, despite a second-place finish. They've got a second chance this year to make amends, this time entering as a bit more of a clear favorite for the Class 2A girls title. 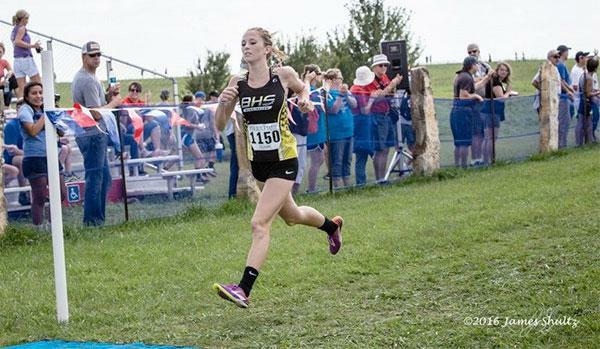 At last week's regionals, Bennington fought off Wabaunsee for the Washington County regional title, in the process posting an average time of 21:12 for its five runners - more than a minute better than any other Class 2A girls team last week. Bennington also has the front-end strength. Kya Johnson is back, though her sister Halle Johnson, a junior, may have a slight edge for the individual title. Halle Johnson was in much the same position a year ago, but had an off-day and fell to 31st place, more than two minutes off her season-best time. Halle Johnson (pictured at right) clocked 19:15 for Class 2A's top time at regionals, while Kya Johnson was the second best at 19:26. They look pretty good for a 1-2 finish at state, but they'll have to fight off Stanton County's Rebeca Avelar (second at state last year) and Wabaunsee's Madeline Hess (12th at state last year). Hess, in particular, has had a very good season. She was third to the Johnson sisters at last week's regional, in a career-best time of 19:46. She's got upward momentum, and experience in racing against the Bennington stars. She's probably not intimidated. Lyndon's girls won the Burlington regional last week with an impressive score of 21. Sophomore Maddie Montgomery, winner of the regional meet in 20:39, will lead the upset-minded squad. Kiowa County, Wabaunsee and the defending champs Ellinwood will also be in the mix for a spot on the podium. The depth of each of those teams makes a title run a bit tougher, but they are certainly capable. 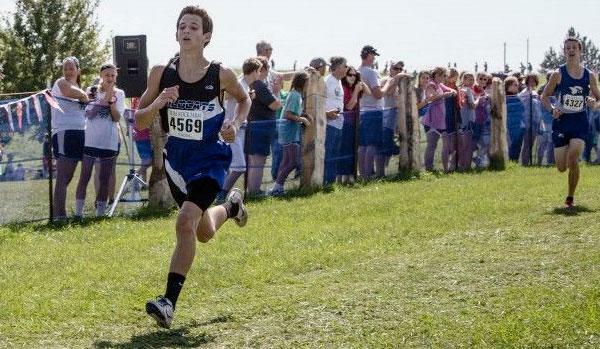 The Class 2A boys individual race is loaded. Yates Center's Hadley Splechter (pictured at right), eighth at state last year, jumped to the top of the list of favorites when he won the Burlington regional in a time of 16:37 last week. But he'll have to contend with Caleb Carrasco of Stanton County (16:42 to win the Meade regional) and Frank Cuevas of Kiowa County (16:43 for second at the Meade regional). Cuevas was third at this meet last year, while Carrasco finished fourth. All three of those runners clocked season bests at the regional meet last week, so you gotta figure they're all in pretty good shape and ready to roll. This is likely to be a really fun race to watch. The boys' team title is up for grabs, since defending champion Maranatha Academy failed to qualify for state this year. I'll tab Kansas City Christian as the team to beat, largely because they've got a frontrunner in Luke Rovenstine (winner of the Washington County regional last week) and because they seem to have the best depth in the field. Last week, they got all five to the finish line in 18:33 or better. That's what probably will keep Yates Center from pulling off that school's first-ever state team title. Though the Wildcats have three boys with top 10 times in the division, they have a gap of over a minute to their fourth runner. At the state meet, that's a lot of points added to your team score. A top three finish, however, is not out of the question. Bennington and Stanton County are the other two boys' teams with a great chance to make the podium. Like Yates Center, they have front-end strength in their lineup, but are struggling to get their fourth and fifth runners to the finish line.